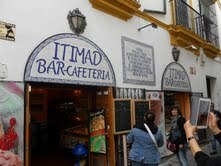 Perhaps Seville is best seen first, before the coast or other historic places. The shock of arriving from peaceful Jerez at the ultra modern Estacion Santa Justa is that one is immediately conscious of arriving in a big city that is absolutely crawling with tourists. Its all a bit daunting. Of course the Cathedral (1402-1506) is fine with all the Moorish influences, built on the site of the previous rectangular mosque, it is actually bigger than St Pauls at eleven and a half square metres. It is huge and gloomy and pretty empty really. There is a Christopher Columbus chapel, but for the whole story, best to visit the old stock-exchange across the way, which now houses the archives of the Indies with some pretty fascinating stuff, including Columbuss log. People troop in, they troop out, then they move onto the the Alcazar, which is an astonishing Palace, genuinely spectacular. The Romans used this site and then when the Arabs came it was famous for a palace that contained a harem of eight hundred women (the cruel al-Mutadid). Pedro the Cruel lived here with his mistress Maria de Padilla who was lusted after by all the men of the court (see the Salon de Carlos V where her rooms were situated) and later Queen Isabella built new quarters here for the management of the Americas. The final resident was General Franco who stayed here when he visited the city. 2000 years of history distilled into one building. This is why people come, this is why it is so crowded, but that doesnt make it any easier to enjoy. Arriving on a Saturday is a challenge. Finding a room is the first one, but wary of being near the centre, I did find something, a room at the top of a cul-de-sac hostel. I am learning, if there is a dead end, motor scooters cant keep you awake at night. Well, that is the theory. Everywhere I go, weddings are on. Saturday is big for weddings and the Spanish dress up for it, enjoy the whole ordeal. The native Sevillians looks handsome, they stand in knots waiting for the brides to arrive. It seems almost every historic church is still in use here. The Alcazar Nevertheless, I cant but help feel that Seville is a disappointment. Its not fair to be disappointed, but perhaps it is just too busy. Ill feel better about it the next day. Its a pleasant 28c, just right for strolling and exploring. Seville is the easiest place to get lost in in the world. More so than Venice. You definitely need a map with you at all times. I found the river and was astonished to discover how undeveloped it was for tourism. The river, Rio Guadalquivir, seems such a natural area to use for restaurants and museums, but only on the Triana side can you sit and eat at Puerto de Isabel 11. Here youll find the cafes serving the shady riverside tables where you can admire Seville and its towers and brilliant domes. You can see Torre del Oro, built in 1220, where in the sixteenth century the gold from the Americas was stored. Tourist boats will glide by taking people down river to see the sights. Others rent pedalos and drift with the ducks. In October the river looks very bare. The heart of the tourism industry beats in the Santa Cruz area bordered by Menendez Pelayo and Jardines de Murillo on one side and El Arenal on the other. Just near my hostel in Plaza de Santa Augustine youll find a remarkable place to visit. Casa de Pilatos. I was curious because in a city of Christians, you would not expect to find Pontius Pilate remembered with any affection and indeed on investigation you discover that this Romanesque villa is built in the style of Pontius Pilates home in 1519 by Marques de Tarifa. Its a melange of Roman, Mudejar, Gothic and Renaissance styles and as such stands pretty much as an example of what has happened to the whole city. It is a mix of all of the dominant invaders particular styles and the result is rather pleasing. The house is enormous and worth a visit. The Romans were big in Seville. Hadrian was born here and he had some influence in the UK, I seem to recall. One suspects he was rather miserable though in having to leaving his native Seville. Actually, I doubt he was born in Seville at all but more likely in Italica (along with Trajan and Theodosius), which was the original Roman town, just twenty minutes away from Seville by bus 34 from Plaza de Armas. Italica was a military base of some importance in the second and third centuries AD. Protected only in 1979 and now laid out as it should be, you can visit the remnants of the Roman villas and the incredibly intact Gladiatorial amphitheatre (the third largest in the Roman world). The seats might be crumbling, but the ring is completely intact and you can experience sitting where the gladiators would have waited and see where the wild beasts where kept. There would be more to see, but Seville was built with stones removed from Italica, which seems to have been abandoned by the next occupants, the Visigoths, when the river changed course some 1600 years ago. The twenty mosaics in the Roman remains are of good quality, some such as Neptune and the celestial beings quite beautiful. Most of the really good Roman finds have been carted off to the archeological museum in Seville, however. You can slink off after a suitable time in the heat and enjoy a good lunch under shady vines at the restaurant opposite the entrance to the site. Italica is free to all EU citizens on Sundays by the by, so dont forget your passport or EU driving licence. Seville was conquered by the Moors in 712, becoming the second city after Cordoba of al-Andalus. It reached maturity under the Abbadid dynasty around 1000 AD and the shape and structure the city stems from that period. It was reconquered by the Christians in 1248 but they did not immediately tear down the Moorish structures, preferring to Christianise and embellish them. 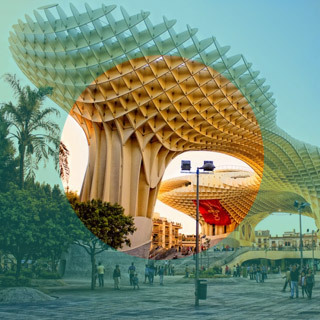 It has made Seville a pretty unique place, with contrasting colours and shapes that are pleasing aesthetically and hint at an alternative Europe, had history gone another way. Now it appears to be a prosperous city (Spains arms industry is centred here).The tourist come for the history, but all around the city modern industry prospers and across the river Triana is really quite a separate modern city. There is a perceptible rhythm to Spanish life. Certain things on certain days. I like that. Christmas is in its proper place, Christmas, rather than starting in July like it does in the States. Whilst I was there the Museum Belles Artes was closed for repairs, which was a bit irritating, although the artists who sell fakes of the stuff inside are still outside selling their wares. Seville has had its share of bad luck. In 1928 they were preparing for the 1929 Fair of the Americas. They took a huge section of the riverside area and built exhibition grounds at Plaza Espana and Maria Luisa Park they also built one of the grandest hotels in the world, the Alfonso XIII. We all know what happened in 1929 (The Wall Street Crash) and the Fair was cut short. But everything is still there. The Hotel, the beautiful exhibition gardens and the Exposition buildings are still visited by all the tourists and deservedly so. This was ambitious building in real style. Seville must have been wealthy back then. Just by the Hotel Alfonso lies the Tobacco factory where the fictional Carmen worked. The building once housed around 4000 women making cigars, but is closed now and the building ihas become integrated into the University. Even though the former Expo site looks forlorn, one can see how ambitious it was. Nevertheless, its position means that it has not become a popular walking place as the 1929 Worlds Fair site has become. A lot of that may be to do with the lack of trees in the new development. Decay is a definite element of Seville. It must be hugely expensive to keep such an old city intact, but I sense the old stuff will still be standing long after the new has perished. Perhaps because there is a tax incentive to restore the old that it gets attention first, but nevertheless, Seville is suffering from too much tourism and too many cars. That and the present day Sevillian is favouring moving out to the suburbs rather than living in the noisy town. The new suburbs are pretty ugly, they lacks trees and the elegant avenues, but they have parking and that appeals strongly to the modern Spanish. Sleeping in Seville is just as hard as Cadiz or Jerez. Forget it. Motor scooters run all night long and cars make a din on paved roads. Also other tourists think nothing of coming in late and then talking on their mobile phones for HOURS at 3am as loudly as they can. The more people shout Silenzia the more strident the phone calls. They also never take their shoes off in the concrete floored rooms above you and always put their TVs on at full blast. TV stations talk a lot and there was when I was there a whole channel in Seville devoted to Tarot reading: a 24 hour Tarot reading channel, live. You call and she chooses the cards and reads them. Weird. If you come for the sun, youll leave for a rest. If you can, grab a couple of hours ziz in office hours or fall asleep at the wheel of your car. Youll need it. When the sun goes down, there are a thousand choices of places to go. Cafe Brasil is one, Cafe Oriente another. The music is right, theyll serve you Rioja if you ask nicely and the decorations a kind of decadent pink. Of course the sun has to be way down, the locals dont go out until very late indeed. There must be some kind of symbiotic relationship between Andalucia and Vancouver. In Jerez I met runaway housewives from that city who are learning Flamenco and now in Seville I find three Kitsilano types who have been cycling across Spain. Theyd just arrived from Cordoba and looked as relaxed as if theyd just strolled to Point Grey. They were exploring Spain inch by inch. The Spanish cycle too, only they wear go-faster blue costumes, in the manner of Tour de France, and no doubt all die very healthy. Seville caters for all. The best time to come is spring and autumn, avoid summer at all costs I am told, far too hot. But come. My initial disappointment gave way to awe. This is a very old but strangely perfect 20th Century city that is, and will always be, thinking ahead. Sometime in the 21st Century theyll have another exposition or Worlds Fair. The new buildings going up now are very exciting. I just hope they maintain them a little better this time around. Seville is a perfect city vacation and the food is excellent,(in fact voted tourist destination of the year 2018 Ed.) wherever you go. In wet miserable London, anytime you feel like café con leche, and have a couple of days to spare, Seville is waiting. All prices reflect year 2000 before the Euro came into being. Everything will have changed. Your travel experience will be different but the express train remains the best way to get there from Madrid.